Going for a walk in the autumn sunshine today, I noticed that the holly trees were bright with berries and it got me thinking : Does this indicate that our lovely summer is going to be followed by a bad winter? So, when I got home, I went online and looked up this old wives' tale. 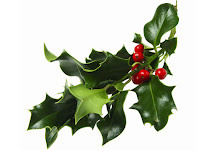 Nowadays, it is thought that early and abundant holly berries are a result of a good spring and a mild September rather than an indicator of future weather, although there are a host of other superstitious associated with holly that are quite fascinating. Christian symbolism connected the prickly leaves with Jesus' crown of thorns and the berries with the drops of blood shed for humanity's salvation. In Celtic mythology the Holly King ruled over half the year from the summer to the winter solstice, at which time the Oak King defeated the Holly King to rule until the summer solstice again. Holly was also believed to have protective properties, being commonly brought into the house to guard against malevolent faeries and was frequently left uncut in hedges to prevent witches running along them. But whether holly in abundance in autumn is a forecaster of bad weather or not, berries of all sorts at this time of year undoubtedly brighten up our hedgerows as well as providing a good source of nutrition for birds like thrushes, blackbirds, redwings and fieldfares - and magpies too! You can read more about this colourful bounty for birds on the RSPB website . Where do they meet ?